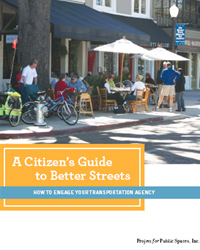 A Citizen’s Guide to Better Streets: How to Engage Your Transportation Agency, the first in the three-part series, focuses on the role of local transportation agencies in street design and outlines effective ways of interacting with transportation agencies. You can purchase these books individually in our store. This title is also available as a free pdf download.